Here it is, mid-February, and I’m wondering why I feel behind on my creative New Year’s goals. A couple weeks back, while having a ball throwing some new mug shapes and starting in on a resolve to make more and better plates, I managed to trigger tendonitis in the right arm. Whee! It’s back, and that means I don’t throw (pottery or disc golf.) So, I bisque fired what I had made, and glazed it and loaded the kiln. It’s all in there right now. Mugs, bowls with a new (for me) lip shape, some new glaze experiments, a really big vase that missed the last firing cycle because it was too big, and a big bowl that missed the last glaze load because it was too big. There are a couple long skinny tiles that remind me of bacon, and the house number tile I promised Christian ages ago. And that’s about it. I started the kiln Sunday afternoon, and it should finish late tonight. Tuesday morning should be about right to open the kiln. I’ll post photos. One thing I ran into during glazing was a bit of a challenge. My big bucket of Potter’s Choice Albany Slip brown is getting low. When I mixed it back up to dip, apparently some of the stuff from the sides fell in and, well, the dipped mugs, after sitting a couple minutes, were a mess. Chunks, thick spots, little hard flakes. Not good. So, today before loading, I scraped off the chunks, flaked off some of the thicker areas, ran a sponge over it to smooth it a little, or a lot, and added a some other glaze for an accent. Should be interesting to see what turns out. The main result, however, is the realization that it’s time to screen and test the specific gravity of the glazes in the buckets – a bit of spring cleaning. Since I can’t throw, that somehow seems like it might be fun. How often do you do maintenance on your glazes? Do you schedule days now and then, or do you just do it when needed? I have a couple glazes that form little crystals now and then, and I’ve learned to screen them every few months. But as for studio-wide focused glaze maintenance, I’m curious about others’ practice. 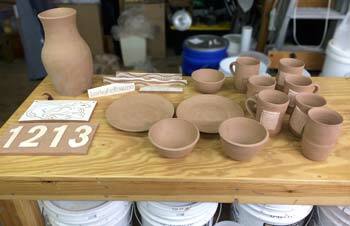 Outside the studio, there are still lots of fun pottery things to do coming up. The Potter’s Gathering, an informal monthly meeting of potters will take place. This is our second meeting. It’s at 2Cousins Pizza in Snow Hill. Potters are welcomed. 6:00pm, Tuesday, Feb. 18th is our next meeting. Bring a mug you made to swap. The Overland Gallery has a teapot show coming up in March, and a beer mug show in April. I think I posted about those earlier. Be sure to see the calls for those shows and get something in to Cynthia Dunn. The 2x2x2″ show was a hoot. I think there were about 60 pieces in the show, and they all fit on a single wall in the gallery. It was a lot of fun. I managed to get 2 pieces juried in, which was a first for me. The reception was fun, too. I enjoy talking-to artists about their work and what got them to the point where they made what they did. Then, the first weekend in May is the Festival on the Neuse in Kinston, and they will have a great indoor art marketplace. Last year, it was really great and promises to be better this year. Check out that event opportunity, too. And of course, there’s the Eastern NC Pottery Festival in New Bern April 12th, 2014. I’ll keep mentioning this event. It’s an amazing collection of potters from Eastern NC. It seems the Seagrove and western parts of the state get all the attention, and for good reason, but there are really great potters in the eastern part of the state, too, and this a fantastic way to meet them and see the coastal influences on a very diverse range of work and styles. If you’re a potter, consider participating. If you like pottery, make plans to go. That’s it for now. Go make something you like! Sorry to hear about your tendonitis, just when you think, I am finally going to get a head in the shop. BOOM something pops into your life and puts your work on the back burner. Feel better soon!!!!!!!!!!!! Thanks Connie. I’m using the time to catch up on reading, planning and some maintenance. But I do hate not throwing.